Abstract Fiber's got a new luxe club! May through August, we'll send you one or two skeins of luxury yarns. Sock to lace weights, some in new colors, and some new yarns. Don't you deserve a special treat every month? The Lo-Lo Bar handmade with love was born flat and placed in a can. Users either pop the bar out and apply it head-to-toe or smash the bar into the recyclable container applying the oils and butters with fingertips. Either way, hydrated soft skin is the result. But now the bar has been raised. 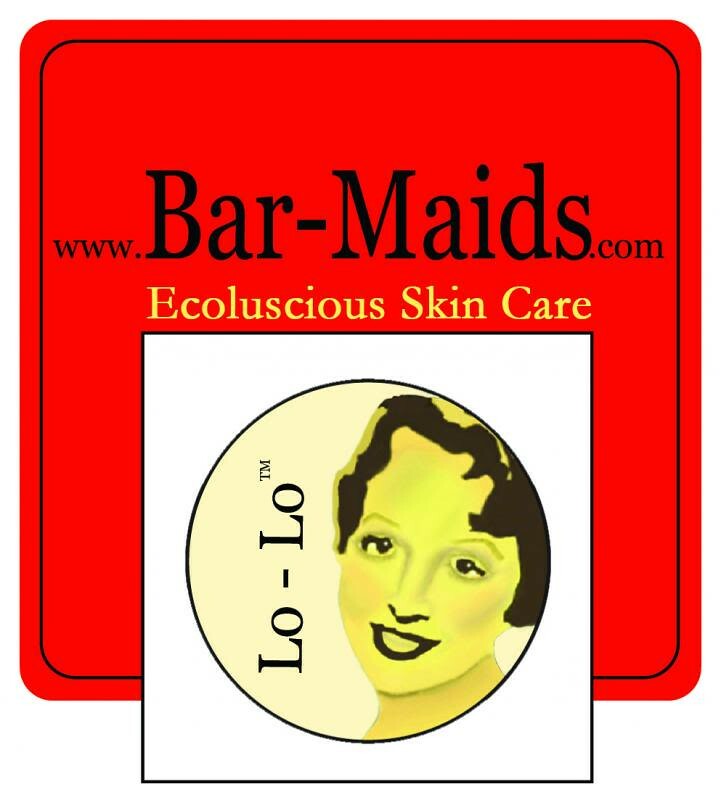 Standing tall in a clear tube at 5 inches and weighing a full 2 ounces, Bar-Maids introduces the Lo-Lo Twist. Though popping and smashing are not options with the Twist, it is ideal if you want absolute precision (engineers and quilters take note) in application and is especially helpful if needing an extension while reaching for far away places like ankles (funny how bending and stretching at some point becomes a challenge). Just plain convenient and available in the (current) top 6 scents. Bar-Maids invites you to do the Twist! Visit the new Nimblestix marketplace. Buy and sell fleece, dyed fiber, yarn and accessories, as well as your patterns. No listing fees and we have the lowest rates around. Shoppers will love that their purchases go straight into their Nimblestix stash! Vendors, get special deals on site advertising if you open your shop soon! Nimblestix- from fleece to finished object. Be Nimbler! Gigi has finished the Loasa Lateritia from The Knitters Curiosity Cabinet Volume I, Gigi and Jasmin enthuse about the Stash Dash, hosted by the Knit Girllls. Also, Jasmin is very happy with Downcast. She mentions competing with Maria from Subway Knits and MrsShoo from the In A Sknit podcast. Gigi blocked the Dr Watson sweater. the Leftie and the Gingko Crescent and the nieces Gingko Shoulderette. There is conversation about where to find a good place to leave the blocking to set. Jasmin mentions Cocoknits blocking boards. Gigi mentions the Quilters Design Wall. Jasmin has made progress on her Vincent and the Doctor from Quere Fibers. Jasmin mentions Isabelle from the Fluffy Fibers Podcast. She is knitting socks out of Biscotte & Cie in the Gazania colorway. Also a pair of socks Poste self-striping yarn in Ibiza. Gigi has put a few stitches on her Mostly Warmness Wristers #behmalong, and also a few rows onto the Water's Edge #matchymatchykal. Our intern, Rina Rose has published a pattern. Jasmin mentions our Directors Cut on how to pick a fleece. Upcoming prize: Simply Socks Yarn Company Poste Yarn in the Blue Nile colorway. how to support your LYS while on a yarn diet. Gigi was attacked twice by the Loasa Lateritia from The Knitters Curiosity Cabinet Volume I. Also, the Dianthus Superbus socks attacked her. She was attacked by a lack of Vanilla socks to take with her. She was working on the Indie Burgh socks, and redid the cuff. This week we are purloining judging criteria from Sasha Torres of the former Spin Doctor podcast, now of Sheepspot, who has a contest for naming the sheep in her logo. Tour de Fleece has started! Jasmin has been spinning up a storm, she plied up her silk and merino from Abstract Fiber, She finished plying Corriedale from Louet, she finished plying the Merino Borderleicester cross from Elizabeth Hubbard. 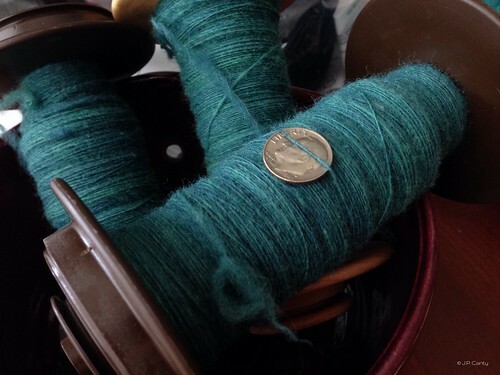 She is spinning a Targhee cross that she purchased from Morro Fleece Works, and is planning to knit the Harvest cardigan for #spakal2014. Gigi wished she had Beeswax or Thread Heaven handy for hemming. Jasmin suggests using a Lolo bar. We will let you know how that works.